Toshiba has spent the last 25 years refining the basic laptop design of flat screen, x86 processor, full-size keyboard and removable storage. Its Portégé R700 will continue that tradition when it goes on sale next quarter, but two other new portable computers Toshiba will release around the same time take the company in new directions. 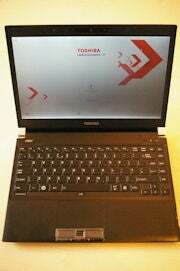 It was in 1985 that Toshiba launched what it calls the "first mass-market laptop," the T1100. That battery-powered IBM-compatible portable PC had an Intel 80C88 processor, an LCD screen and a floppy disk drive. At 66 millimeters thick and weighing 4.1 kilograms, it was a far cry from the thin and light laptops of today. Apple defined the thin-and-light category in 2008 with its MacBook Air, which weighs 1.36kg and has a 13.3-inch screen, but no optical disc drive. Since then, challengers have appeared, including the Lenovo IdeaPad U350 and the Dell Adamo. Toshiba, meanwhile, has been whittling its Portégé R series down in size, but not in function, and when the R700 goes on sale next quarter the lightest model will weigh just 1.3kg. The R700's tapered case, 25.7 mm at its thickest point, has room for an optical disc drive (an external add-on for the slimmer MacBook Air). The R700 will run for up to eight hours on a single charge of its six-cell battery, according to Thomas Teckentrup, Toshiba's general manager of product development and strategy. Different countries will see the R700 in different configurations, with Intel Core i3, i5 or i7 processors and up to 8GB of DDR3 DRAM. Other options will include 802.11n Wi-Fi and Bluetooth 2.1 wireless networking, a hard disk up to 500GB in capacity or a solid-state drive up to 512GB, and a built-in DVD-RW drive, either single- or double-layer. The Portégé range is aimed at business users, but the same computer will also sell to consumers as the Satellite R630, minus the fingerprint reader and docking connector. Teckentrup wouldn't name a price for the R700, saying it would vary by country and options chosen, but said it will be less than the R600 it replaces. While the R700 follows Toshiba's full-function laptop tradition, the other two devices it is releasing to celebrate the T1100's 25th anniversary take it in new directions. 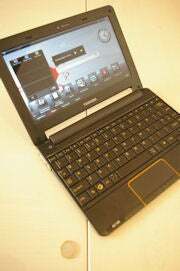 The AC100 is a "smartbook", a netbook built with hardware and software more usually found in smartphones. Forget Windows on Intel x86: it runs Android 2.1 on an Nvidia Tegra 250 processor with a 1GHz Arm core, and weighs around 870 grams. It has a 10.1-inch LED-backlit screen, 512MB of RAM, two USB ports, an HDMI video output, an SD Card reader and an SSD up to 32GB in capacity. Some models will have a built-in wireless modem to connect to 3G (third generation) mobile networks, and there's also 802.11n Wi-Fi. Toshiba has enhanced the Android software so that the AC100 displays different pages of widgets and applications depending on the Wi-Fi network it connects to. Users can customize up to five pages for business applications, home entertainment, or airport information, for example. Because the AC100 isn't a phone, those applications can't come from the Android Market, but Toshiba is looking at other ways to offer app downloads, Teckentrup said. He wouldn't commit to a price for the AC100, but hinted it would be toward the lower end of the range for existing netbooks. Toshiba will stray furthest from the beaten track with the third device, the Libretto W100. It has two 7-inch LED-backlit touchscreens, one in each half of its clamshell case, and runs Windows 7 Home Premium on an Intel Pentium U5400 processor. Turned on its side, the W100 looks like a tiny laptop without a keyboard. There are only two buttons, one of which brings up a virtual keyboard for hunt-and-peck typists on the lower touchscreen, while the other launches Toshiba applications for managing documents, widgets, and clippings of information. Stood on its end, the W100's two screens look like the pages of an open book. Amazon's Kindle software for Windows will only use one of those screens, but Toshiba plans an online bookstore delivering books to its own e-reader application, capable of showing two pages at a time, Teckentrup said. The W100 fits comfortably in a jacket pocket and, with a battery life of less than three hours, that's probably where it will spend much of its time.